Since a camp isn't complete without bathhouse facilities, complement your camp while establishing a log theme with versatile Conestoga bathhouse cabins. They offer models with a variety of combinations of shower, restroom and/or laundry facilities. And for your physically challenged guests, the restroom/shower area in the ADA bathhouse provides an uninterrupted five-foot diameter for maneuvering a wheelchair, so they too can enjoy the pleasures of cabin camping without restrictions. With all your guests in mind, the porch or porches, depending on the model, offer a place to wait for restroom and shower availability. Pilot Rock Park Equipment offers four new bench styles that will fit public parks, campgrounds and streetscapes. All new styles incorporate armrests so they are more accessible. Each bench includes surface-mount or embedded installation options. Flat, contour and double-contour designs; powder-coated frames; four seat material choices, various colors; and 3-, 4-, 6- or 8-foot lengths create hundreds of possible variations to fit any landscaping requirements. The benches feature a new modular design that uses 3-foot and 4-foot modular components, which allow you to build benches of any length you need. Recreonics, Inc. is one of the nation's largest suppliers of commercial swimming pool equipment and aquatic recreation systems. The centralized location, huge inventories, 180-page full-color catalog, design manual and competitive prices make Recreonics a superb choice for all your aquatic needs. Kids CornerTM by Soft Play, L.L.C. is a new line of modular playground equipment designed for children ages 18 months to 5 years. Safe, durable Kids CornerTM play centers are perfect for smaller spaces, indoor or outdoor use, and are designed to encourage healthy play among toddlers. Easy assembly, no special tools are required. If cigarette litter irritates you, you can get real solutions in a real variety of attractive models with Smokers' Outpost® litter solutions. The new Smoke Stand features a sleek, architectural design and is the newest addition to the metal versions of the original, patented Smokers' Outpost® design. This model is available in black or silver and provides easy-to-clean convenience with built-in security options to keep it from walking away. Constructed of durable aluminum and powder-coated to eliminate rust or tarnish, the Smoke Stand helps you enhance your facility image for years to come. Architek, United Receptacle's newest award-winning collection of waste receptacles, combines clean, contoured lines with horizontal-patterned perforated steel. The design achieves a layered dimension that accentuates the architectural style of the 21st century. In addition to providing durable and functional litter control, the attractive and innovative designs add appeal to any environment. Five models offer a variety of applications including covered, open or sand tops, in capacities ranging from five gallons to 38 gallons. 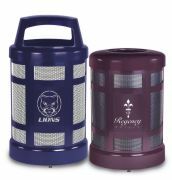 The receptacles can be customized with a variety of color combinations and laser-cut steel panels to prominently display logos or messages to enhance appearance. EnWood Structures, a leader in the glued laminated wood bridge industry, now has a spectacular new bridge featuring an overlook. Engineered for utility and aesthetics, this bridge can be a feature attraction among your greenway. The design team at EnWood can work with you to strategically position your bridges and overlooks to maximize your setting. EnWood Structures offers high-quality laminated wood bridges, superior customer service and competitive pricing. Harley/Cherrington, a leading manufacturer of landscaping rakes and beach cleaners, offers its new compact walk-along sand sifter. Self-propelled, the unit has a zero-turn radius and tethered remote control. The joystick steering with independent rear-wheel drive allows for maneuverability in tight spaces, including within inches of walls, trees and cabanas. Three interchangeable screens remove rocks, debris, seaweed, bird droppings, cigarette butts, encroaching grass and small roots. Other features include center-wheel hydraulic depth control and settings, as well as spacers for accurate and consistent depth settings.